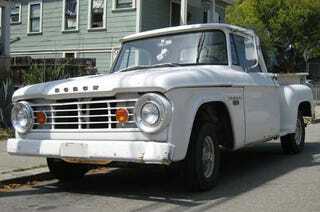 We've seen lots of cars and a few trucks in the Down On The Street series, but just one proper Detroit pickup truck. I've shot a couple more y'all haven't seen yet, but I've been sticking to an arbitrary cutoff year of 1955 for pickups to qualify for photographing (actually, I should probably use 1953, that being the year Hank Williams died). My assumption was that such trucks are still seen in large numbers elsewhere in the country, and therefore they aren't quite as special as the cars. But I see plenty of interesting older pickups around town (such as the Dodge above, not to mention a few early-generation Japanese pickups) and I'll be happy to start shooting them for DOTS if the readers so wish. So, readers, what is your wish?